A few days back, I prepared a potato gratin to go with our salad. It’s pretty simple to put together and extremely tasty too. This is, perhaps, one of the most satisfying dishes that I’ve posted on this blog. Here’s my recipe for a low-fat potato gratin dish that is rich in flavor, but not in fat and calories. Preheat the oven to 375 degrees F. Lightly butter an 8x8 inch baking dish. Melt the butter in a skillet over medium heat. Add the onions and cook slowly until caramelized. Add the garlic and cook for 2 minutes. Season with salt and pepper. Meanwhile, in another pan, prepare the bechamel sauce/white sauce by melting the butter, blending in the flour & adding the milk gradually while stirring constantly till the mixture thickens, 3-4 minutes. Add salt, pepper and red chilli flakes and cook for 1-2 minutes, stirring frequently. Arrange half of the potato rounds in a layer, in a slightly overlapping fashion in the baking dish, and season with generous amounts of salt and pepper. Spoon half of the onion mixture over the potatoes. Repeat to make a second layer with the remaining potatoes, season, and sprinkle the rest of the caramelized onions over the top. Pour the white sauce as evenly as possible all over the potatoes. Bake for 50 to 60 minutes, until the liquid is absorbed, potatoes are tender and the surface is golden/lightly browned. Let stand 10 minutes before serving. The gratin had a wonderfully rich and creamy texture even without any cheese or heavy cream. This one’s definitely a keeper! This is my entry for Dhanggit's Perfect Party Dishes. Never seen this type of gratin recipe without tons of butter or cream, you made it really less fat. Looks so yummy! I love any type of gratin..Nice fat free recipe..
Am here after a long time TBC. Hope you are doing good. Have a lot of catching up to do on your blog. the gratin really really looks yumm and satisfying!! Got to give it a try. Love the way the spoon's drooling and dripping white sauce - must be one of your best photos! Divya- Me too. :)I've made one with cauliflower too. Shella- it is really nice to see you here. I hope you are coping well. Keeping yourself busy is the key. Lots of love and hugs to you. Take care. Sra- really? I was thinking that I should also put a caption alongside the pic indicating that it was a spoonful of the dish. It kind of seemed to blend into the background. Oh it's very evident that you have a spoonful up - looks absolutely tempting. This is the post that i could see in the background as the IE error was spewed out... so couldn't comment on it earlier... Am definitely trying this. Potatoes and cheese are such a great combo. Please do, it is really very good! :D It might be even better if u use whole milk. I did not have any leftovers for the next day. Makes it a little easier to indulge without feeling guilty. btw, hv a good vacation! Gratin dauphinois is an all time favorite french dish! Thanks for giving me an idea to do this for my little girl's party!! The truth is i have never made this :-) Thanks for this great entry of yours!! i'll keep you posted for the round up! I clicked over from Dhanggit's blog. 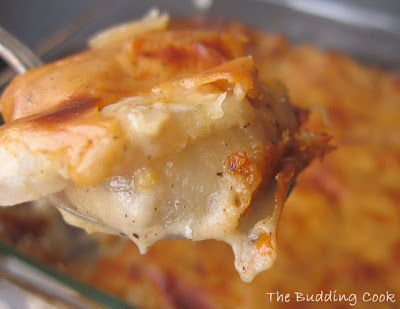 I love Potato Gratin or Scalloped Potatoes, this is so great to cut down the calories since I rarely make it for that reason! Your photo looks absolutely scrumptious! finally a recipe I can make when I have run out of cheese&cream! Thanks! Thanks! Glad it worked for you! I made this recipe yesterday and it is so creamy and absolutely delicious. Low Fat as well which makes it more amazing! Anon- I'm so glad you liked it! Thanks for letting me know. Anon- You are very welcome. It's one of my favorite dishes too. I'm happy to hear that you liked it. Thanks! Was great. I added a little nutmeg to the white sauce along with white pepper, and a little thyme and rosemary to the onion mixture. I also had to add a little bit, like a teaspoon of olive oil, because the onions were sticking in my non stick pan ;(. Also threw in two shallots I had wasting away. Yana- I like all your additions especially the nutmeg. I'm glad you liked the recipe!